Talent and hard work are not always enough to keep a player in the National Hockey League. It also takes good health and a certain degree of good luck to enable a non-star player to carve a niche in the world's most prestigious hockey league. Tomas Divisek was not one of the fortunate ones during his playing days in North America, but he has enjoyed a fine career in his native Czech Republic in the decade since his return to Europe after a three-year stint in the Philadelphia Flyers organization. Now 32 years old, Divisek is regarded widely throughout the Extraliga as a veteran leader who delivers in the clutch for his team. He has cemented that reputation this spring in leading a playoff charge that has brought prohibitive underdog HC Kometa Brno within three victories of one of the most shocking championship seasons in recent European hockey history. 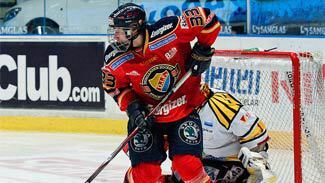 Divisek, who spent the early part of the 2011-12 regular season in Switzerland on a one-month contract with HC Davos (five points in seven games before returning to the Czech Republic), leads all playoff skaters with 18 assists and 24 points in 16 games. Starting on a line with young forwards Jakub Svoboda (five goals, 13 points) and Tomas Svoboda (eight goals, 13 points), Divisek has been a force on the power play and at even strength. He also has a plus-14 rating and has won nearly 58 percent of his faceoffs. After finishing eighth during the regular season, Kometa was forced to play in a best-of-five playoff qualification series before advancing to the best-of-seven remainder of the postseason. Kometa swept Jaromir Jagr-owned HC Rytiri Kladno (Kladno Knights) in the qualification round, and in a stunning quarterfinal-round upset, the team from Brno upended top-seeded HC Sparta Prague in six games. Sparta led the series 2-1 before Kometa surged to three straight wins. Brno won Game 5 on the road and returned home to eliminate the pre-playoff championship favorites. In the fifth game against Sparta, Kometa defenseman Milan Hruska sustained a serious injury early in the second period and was carted off on a stretcher by emergency personnel after a hit from Sparta's Yorick Treille. The situation triggered a fight between Brno's Jakub Koreis and Sparta's Alex Foster. Brno, which was trailing 1-0 at that point, rallied for three unanswered goals. As the scene shifted for Game 6, Divisek stepped to the forefront with a critical goal and an assist that forged a lead Brno never relinquished. Despite the major upset of Sparta in the quarters, Kometa entered the semifinals as an underdog against second-seeded HC Plzen. By this point, however, Brno's collective confidence was soaring. The club roared out to a 3-0 series lead with a pair of road victories (4-3 and 1-0), followed by a 1-0 win on home ice. In the opener, Divisek tied the game at 3-3 with 10 minutes remaining in the third period and then set up Jakub Svoboda's game winner with less than five minutes left in regulation. When the series moved to Brno, Divisek provided the key assist on Jakub Svoboda's late second-period goal that proved to be the lone goal of the game for either side. Plzen finally broke Kometa goalie Jiri Trvaj's two-plus game shutout stretch in the early minutes of Game 5 in Brno and went on to win 4-3. But Kometa finished the series with a 7-2 win in Game 5. The Divisek line nearly was unstoppable, with Divisek scoring twice and adding two assists. As a result of taking out the top two seeds in the playoffs, Brno has advanced to the finals against HC Pardubice. Entering the quarterfinals as the third seed, Pardubice survived a seven-game battle with HC Vitkovice in the first round and then knocked out HC Byli Tigri Liberec (Liberec White Tigers) in six games in the semifinals. Pardubice has been led offensively by Martin Bartek, who has six goals and 17 points in 15 playoff games after injuries limited him to just 28 games in the regular season. Pardubice won 5-4 in overtime in Game 1 as Divisek was limited to one assist. There was no stopping him in Game 2, however, as he broke free for a goal and three assists to lead Kometa to 6-5 win. On Friday the scene will shift to Brno for the next two games. If the series were to go longer than five games, Game 6 would be in Brno on April 19 and a climactic seventh game would be held in Pardubice on April 21. Divisek has been to the finals three previous times in his European career. He was a member of HC Pardubice's championship-winning team in 2004-05, and he's also been part of Pardubice and HC Slavia Prague clubs that fell short in the last round. In recent years, he's done much of his best work in the playoffs, totaling nine goals and 33 points in his last 26 Extraliga playoff games (spread through three seasons). Last season he captained a weak BK Mlada Boleslav club that was sent to the relegation round, where Divisek had seven goals and 13 points in 15 games. At one point early in his career, Divisek was considered a fast-rising prospect in the Philadelphia Flyers system. A seventh-round pick (No. 195) in the 1998 draft, Divisek's combination of size, hustle, versatility and above-average hands made him the most highly regarded of three young Czech prospects with the team at the time (Vaclav Pletka and Petr Hubacek were the others). Divisek opened eyes at the 1999 World Junior Championship, where he led all players in the tournament with seven assists while centering a line with Pletka. Coming to North America for the 1999-2000 season, Divisek won team rookie of the year honors for the Philadelphia Phantoms of the American Hockey League after totaling 18 goals and 49 points in 59 games. He made his NHL debut the following season during a two-game call-up, and he finished the season with an outstanding performance in the Calder Cup playoffs (four goals and 13 points in 10 games). Off the ice, he was the lone player among himself, Pletka and Hubacek to gain proficiency in speaking English and fitting in readily with his North American teammates. Unfortunately for Divisek, health and circumstance were not on his side. Twice when he was on the brink of an NHL call-up he sustained serious shoulder injuries. After the second injury, the organization grew concerned that the 6-foot-3, 230-pound forward had lost the grit he showed as a rookie in going to the net and battling for pucks along the boards. He became more of a perimeter player, and his production dropped. Divisek did receive a three-game NHL call-up in 2001-02, scoring his first and only NHL goal in the process. But his iffy health record, declining production and rise of Ruslan Fedotenko to fill a similar role with the Flyers pushed him out of the organization's plans. As a result, a 23-year-old Divisek went back to the Czech Republic in the summer of 2002. Although he soon showed that he was not "damaged goods," the NHL never came calling again. Instead, Divisek has thrived in Europe. Apart from two short stints in Switzerland, he's been a fixture in the Czech league ever since his return to Europe. While the Extraliga is a finesse-oriented league and Divisek's skating style is anything but pretty, he has been highly effective in his home league. He's topped the 20-goal mark twice, flirted with it a few other times in shortened seasons and also topped 90-plus penalty minutes three times.